Today’s post is my entry in the Yummy Food/Canarias.com Recipe Competition in which the best article featuring a recipe or some other aspect of Mediterranean Cuisine will be awarded a Kindle Fire HD as the grand prize. As I am travelling, I am posting links to two recipes for Paella that I published some time ago but the competition deadline is not until February 7, 2014 so there is plenty of time for all of my regular readers to hustle something up and try their own luck. All the details can be found here ate Yummy Food. It struck me a while ago that all my favorite dishes are rice-based and, aside from a whole range of Biryanis, pilafs, and Asian fried rice dishes, I have a special love for Risotto, Jambalaya and (of course) that quintessential Spanish dish, Paella, in all its glorious permutations. A (slightly modified) take on Paella Valenciana. Go for it John. It sure looks yummy to me. Delicious. Wishing you lots of luck. 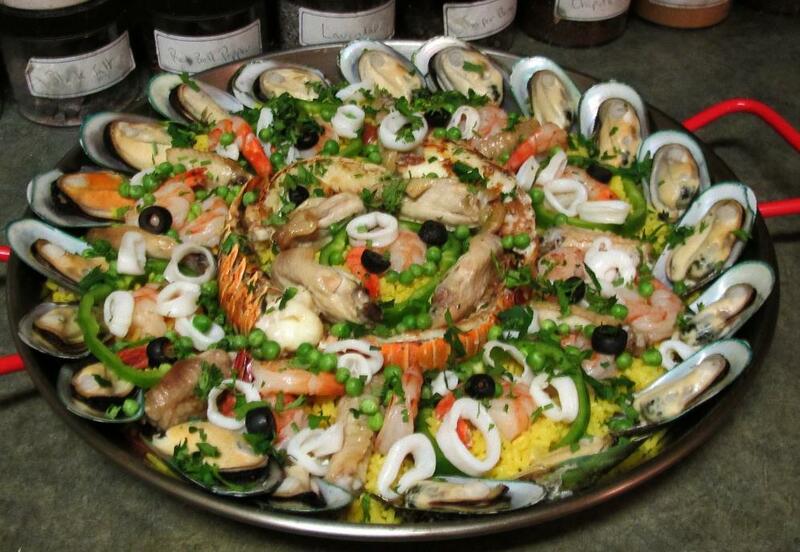 Paella is one of my favorite dishes. My dad was from Alicante Spain and he taught me how to make this dish as soon as I was old enough to see over the stove. Your recipe looks great and I think you have a good shot with this dish. GOOD LUCK! Someday I want too cook one over an open fire the traditional way! The great thing about cooking it over an open flame is everything cooks evenly. I don’t know about you but when I cook this on the stove top I have to constantly rotate the pan for even cooking. i hope you win then!